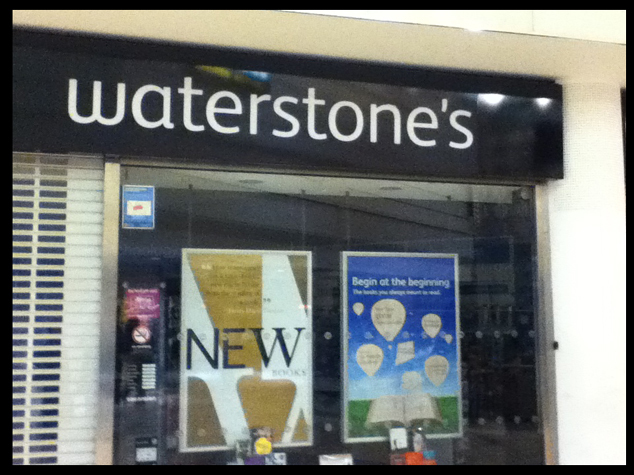 So Waterstone’s is dropping the apostrophe to become Waterstones (note how I, unlike everyone else on the internet that has written about this, am not asking you to note the correct use of the apostrophe when I type Waterstone’s). Now I like an apostrophe as much as the next man – I’ve read Eats, Shoots and Leaves – and as someone with an interest in writing I like to try and make sure I get my punctuation as correct as possible. But you know what, it’ll be alright. There is such a long and well documented history of the misuse of the apostrophe I’m surprised people still have the energy to get upset about it. Most of the time the meaning of the words remains clear and unambiguous even with missing apostrophes, or indeed extra ones flung around all over the place. The difference between ‘eats, shoots and leaves’ and ‘eats shoots and leaves’ is significant, but most of the time we can all figure out what a sentence is trying to do. The difference between ‘Toby’s book’ and ‘Tobys book’ is pretty insignificant even if it does pain me to leave it written that way, all underlined in red by the helpful WordPress spellchecker. Obviously it doesn’t help that it is Waterstone’s that’s doing it. I saw a business logo the other day, I wish I could remember which one it was but it has disappeared from my mind, that had dropped the apostrophe from its logo but left the space where it would have been. This is branding and graphic design for you, it is more about image and feel and style then grammatical correctness. And in a way when it comes to branding I just accept it. I long ago resigned myself to the idea that branding is essentially vacuous and not worth worrying about. If Waterstone’s thinks that it would be a good idea to unify the shopfront logo with its web address (one of the reasons I heard for the missing apostrophe) or if they paid a design consultant to come up with a fresh new design that will appeal to the kids (or whichever demographic they want to romance) then whatever, that’s fine. It could be worse. They could have added an interrobang to the logo. And if the Waterstone’s logo means that much to you take another look at that ‘a’. It looks like it is in a completely different typeface from the rest the logo. Just saying. But then maybe it isn’t a matter of branding at all. Maybe there are only a finite number of apostrophes out there and for every word you see that needs one but hasn’t got it there is one that has one and doesn’t need it. Maybe Waterstone’s didn’t want to drop their apostrophe, maybe they had to due to a depleted supply because of all the greengrocer’s signs out there saying things like ‘potatoe’s’ or ‘carrot’s’. 19.01.12 – I was browsing twitter this evening which led me to an article on Waterstone’s pick of debut novelists and in it was a quote from Chad Harbach, author of The Art of Fielding, regarding the new Waterstone’s logo. The fact that it came up at all is interesting, but I liked what he said so I thought I’d tack it onto the bottom of this post. I like your style Chad, and I’m quite looking forward to reading your book, but never mind the apostrophe. What do you think of that ‘a’?